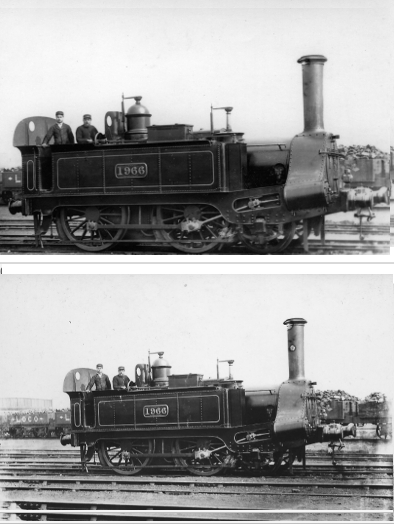 According to Baxter, 2-4-0T No.1966 was withdrawn in 6/1888. The mystery is - how come the wagon in the background has a large letter L painted on by the diamond symbol, 20 years before these large letters came into use? This photograph was taken by Richard H. Bleasdale around 1882, just outside Walsall engine shed. The large ‘L’ on the wagon is simply the start of ‘LOCO’ — so lettered because it carried coal for the Locomotive Department’s use. ‘LOCO’ can be seen in full on wagons in other photographs taken here at the same time, as well as in many other shed scenes. On a sharper print of this photograph, the end of the wagon above the engine’s front bufferbeam reveals similar markings. To the right of the engine headlamp top is a white horizontal diamond, while between the lamp and the smokebox front part of a large letter ‘O’ can be seen: height of letter approximately 2 feet.